Elevated Enviro rates and reviews products based on how sustainable they are by how much of the product can be recycled after use, waste diversion. We look at products through the lens of reduce, reuse and recycle. We take our knowledge of recycling facilities and product materials to inform you of what happens to your products after use. What's next in their life? This post is for Dial Eco Smart Coconut Water Mango Soap Refill Pack. 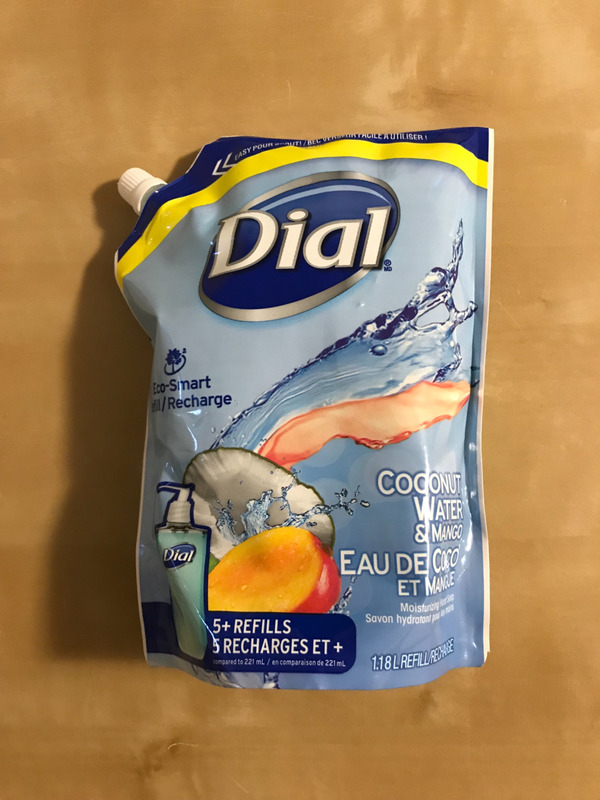 We like how Dial is reducing the amount of plastic by using a bag format instead of the traditional jug that most refill type products come in. This means that less plastic waste will head to our landfills. That is an important distinction, landfills, as that is where this product will likely head to after use. In many of our reviews we mention that plastic ranges in quality. This is why we can recycle our yogurt containers but not the lids, they differ in quality. The quality of plastic is unknown on this product, it is likely low and as a result most plastic recycling facilities will not be able to recycle it. This product stands a high chance of being landfilled due to the unknown quality of plastic. It would really help if Dial put the quality type so facilities could know. There is also a small plastic lid on this product that will miss most recycling facilities sorting process and likely be landfilled as a result. The reduction in plastic is great but not knowing the quality really means this products is likely going to visit the landfill after use. As a result this product gets an Elevated Enviro rating of 2.5 out 5.